The second annual Masters Synchro Conference was a huge success with 27 people attending the day, a real improvement on last year’s turnout and a more focused itinerary for the day based on improving performance. The day was extremely informative, ranging from Judges Feedback to some practical application of choreography to enhance routines raise future routine scores. The day offered four engaging sessions including a first look into the FINA changes for 2018. The day kicked off with international judge Sarah Clarke. Her presentation went through the new changes to the judging structure for 2018 and provided details of what judges would be looking for with the new format. She broke down the percentages of scores for both technical and free routines and highlighted where improvements could have been made at this year’s event to score higher. All swimmers took away some top tips and a good understanding of how to wow the judges at next year’s National Masters Championships. Stephen Adshead from Out to Swim gave an insight to recruiting males into the sport. He took the candidates through the highs and lows of his Male Synchro Challenge and offered some real insight into the best ways to recruit males using creative marketing and social media, the best ways to retain men in the sport and most importantly how he is looking to further expand the programme to recruit more males ready to compete at next year’s championship. After a great lunch, Sarah Darragh delivered a session on choreography, detailing the best ways to spice up your routines and where to look for ideas and themes. The session looked at how synchro as a sport has changed over the past 10 years and focused on areas that Masters swimmers could develop in order to bring their routines and choreography up to date. The session finished with a practical group session where attendees has to develop their own routines ready for the pool session. The final session of the day was delivered by Collette Crow, ex-GB swimmer and Commonwealth coach, supported by Annabelle Surch, former swimmer and ex-GB coach. 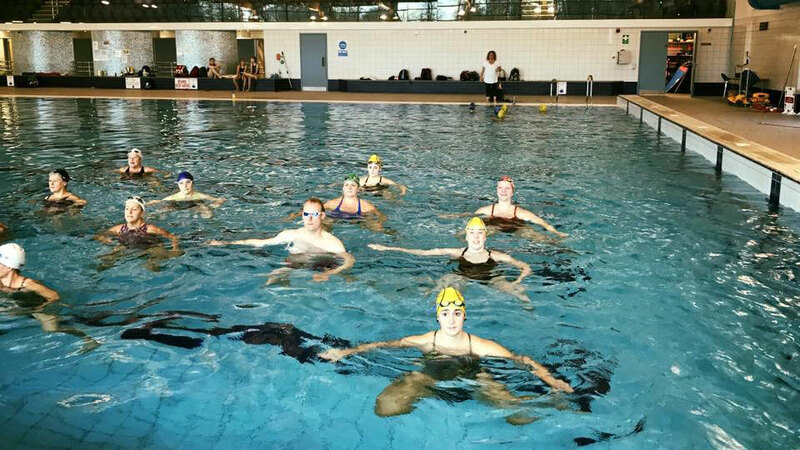 The focus of this session was to allow attendees to apply their choreography skills in the water, concentrating on: smaller patterns, preparation counts and transitions. There was even a little time for some figure coaching of the new bent knee spinning 180. All swimmers came away with some individual feedback and some clear areas for their future development in solo’s and team routines. The close of the day brought more information to the attendees with the circulation of a swimming training pack written by Louise Ross. The pack contained four pool sessions that would complement current training and enhance stamina, speed and strength in the water. Sport is always changing, we should prepare to adapt. Look at your community, how can you engage a new audience to enter and enjoy our sport. Don’t be afraid to try new choreography – clean pattern changes and execution are more important than lifts. Train in and out of the pool to become a well-rounded athletic synchronised swimmer. Support needed for 2018 Masters Competition – please get in touch. If anyone would like to volunteer to help with any aspect of Masters please contact me at sarah.darragh@swimming.org.